In the Grade 6 curricula, there are many opportunities for meaningful integration between subjects. The Sky Science unit and Large Number topics fit harmoniously together. With a focus on problem solving, students first went about solving a variety of astronomy themed problems, such as “How many times further is Saturn’s distance from the Sun than Earth’s distance from the Sun?” These problems had students working with numbers in the millions and billions, as well as estimating, rounding, using appropriate units and converting distances. Students had seen many models throughout the Sky Science unit, and they were able to intelligently discuss the above model of the planets. They concluded that there were many flaws in the model, especially when it came to scale. Proportional models were introduced and discussed, using maps as examples. Non-examples were also provided, and proportionality was related to previously discussed geometric transformations (dilation). Students were given few restrictions to compose their scales, but it was decided upon that it must be of manageable size. Finished products ranged from 75 cm to 4.5 m in length. Groups had to decide upon a scale, and where the planets’ distances would fall upon their scale. There had been no formal instruction on scales and proportionality before beginning, except for measuring out the Saturn and Earth distances problem on a measuring tape. Many groups started by choosing a simple scale, such as 1 m = 1 billion km. They didn’t always have foresight in mind, as they then realized that some of their initial scales were too large or too small. The inner planets posed a problem for many groups with small models, as these planets are very close together in the scale of the solar system. Many groups chose to round some of the numbers given, after a lengthy debate/problem on significant differences and rounding numbers. In almost all cases, the rounded numbers provided accurate answers (when compared to calculations with the exact provided numbers). Using Earth as a benchmark was helpful for some groups. They realized that Earth is 1 AU from the Sun (as that is the definition of an AU). 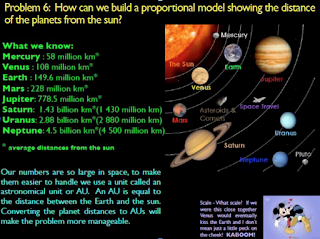 The groups that used AU in their models seemed to have an easier time with organizing their planets along the scale. Many groups did not take this approach and worked with millions of km instead and had to provide many conversions to create their scale. Many groups did not have formal knowledge about making a scale, and often used logical approaches, based on their chosen scales. Measuring tapes and other manipulatives were helpful for struggling groups. Almost all groups came up with accurate answers and most provided calculations on the final copy of the problem, but the real interesting information was in the group conversations while devising a scale, model and converting units. Also, every group needed to discuss ideas in various ways, before all members understood the process. Conversion and making a proportional scale is not a simple task to get your head around. Even though this turned out to be a difficult problem for many students, they found value in having to figure it out themselves, rather than being given a predetermined method for finding a scale. Students were excited when they grasped the ideas and were enthused to speak with others about their findings. Models were compared to one another to ensure that proportional relationships were similar, even when based on different scales. Students were also enlightened about the vastness of the solar system and their curiosity about astronomy topics prompted inventive math work. Candice, I like how you have integrated math and science through your big numbers and sky science inquiry. As you point out, through this engaging learning activity you were able to address many key curricular outcomes and develop a deep understanding. The photographs are effective in demonstrating what the students have learned and you share some great insights on "inventive math through astronomy".